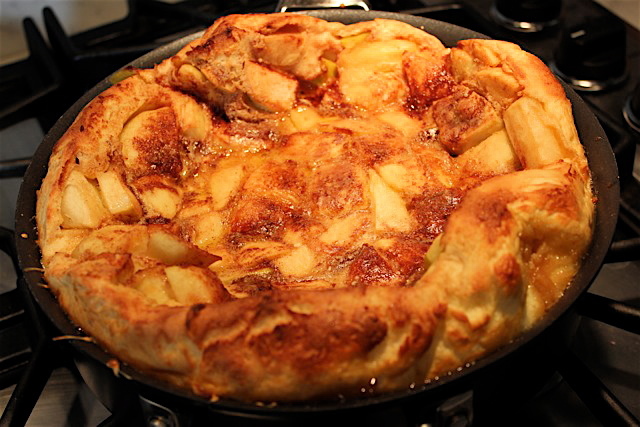 The Kitchn headline read Weekend Breakfast Recipe: The Apple Pancake. Not Apple Pancakes but THE Apple Pancake. I knew the inspiration had to be Walker Brothers. I’ve talked about Walker Brothers before, but haven’t lavished enough attention on the star of their menu, the apple pancake. If you’re from Chicago or have visited and eaten an apple pancake you’ll know from the pictures that The Kitchn recipe doesn’t lavish nearly enough caramel on its pancake. The real apple pancake boasts a heavy crown of buttered apple slices topped with a layer of maple caramel that’s an inch plus thick. It’s not breakfast, but a treacly, over-the-top dessert. My mom has confessed that she and my dad would share one for dinner when they were first dating. It’s the kind of indulgent that works best when you’re still naturally skinny and so in love the calories don’t count. They probably told themselves it was healthy. Apples, you know. 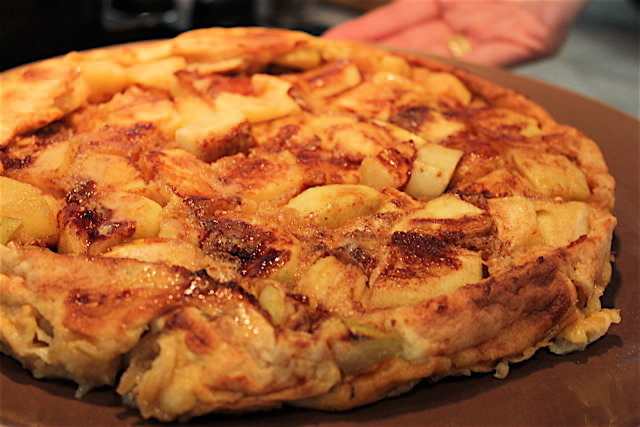 I followed the Kitchn recipe and while it didn’t make The Apple Pancake, the one it produces is stunning, delicious and easier to make than a frittata. It’s also not embarrassingly decadent so it’s doable for friends and very doable for a date night. A low-cal date night, of course. Thank you, Elan, for snapping pix while I scrambled to plate it up for our clients. Ahhh this makes my heart smile. Reminds me of when my grandmother would take me to Walker Brothers and although I always ordered chocolate chip pancakes (something I’d never order now! ), I remember her ordering the apple pancake and the look on her face when the waitress would place it in front of her. Total joy. Fortunately, you are in LA and we are still in glencoe. Therefore you are out of sight when we indulge!! p.s. we each ate our own WHOLE apple pancake!! Happy Memories, Katie! Chocolate chip were pretty good, too. I was so thrilled to see this recipe on your website! I have eaten apple pancakes at the original pancake house in Portland and they are to die for. Made this on New Year’s morning for my family and we loved! Thank you so much for. The recipe. Stella, I’m so happy to hear it! What a delicious way to start the New Year.